It’s that time of year again! And no, we’re not talking about Halloween, or even Thanksgiving (however fun those are). It’s time to plan how you’re going to end your organization’s year. We’re not here to give you advice on financials or tell you what your company’s goals should be. Our focus is to remind you of another vital, but sometimes forgotten, part of year end planning: thanking and reaching out to your customers (or clients, or donors, or patients… you get the picture). As you’re probably well aware, the holidays provide a much-needed excuse for offering a sale, creating an event, reminding someone of an appointment, or requesting a donation. In other words, it’s the perfect time to re-energize that relationship between your organization and the people who keep it running. Direct mail postcards are a great way to reach out and stand out from competitors during this busy time. We’ve shared before how postcards can be used to uniquely market your company’s events. This is especially true for end of the year occasions and appointments. For example, if you run a salon, you could remind clients to book a hair or beauty appointment before their next holiday party. This method also works for medical practices to remind patients to get their end-of-year checkups. An in-depth study sponsored by the Postal Service Inspector General's office found that direct mail postcards trigger the brain’s center of desirability and value, something that wasn’t found when the study’s participants looked at email ads. In that particular study, researchers concluded that postcards elicit a greater emotional reaction and play a more direct role in purchase decisions than online advertisements do. People are absolutely inundated with holiday offers at the end of the year. Email inboxes, in particular, get hyper-crowded during the holidays. And while holiday deals also find their way to physical mailboxes, there is far less competition in direct mail than there is online. Holiday specials never get old, until they do. It’s important to make your company’s offer really useful to the receiver in the first lines of copy. A “Happy Holidays! Get 10% Off All Clothes in Store!” won’t cut it. You need to convey why your audience needs this special. Maybe you remind them of a holiday party next week that they still don’t have a dress for. Maybe you indicate the change in weather by featuring a popular sweater for sale. Whatever it is, really think about how you can inspire your audience while also providing value to someone who’s likely just as busy as you are. 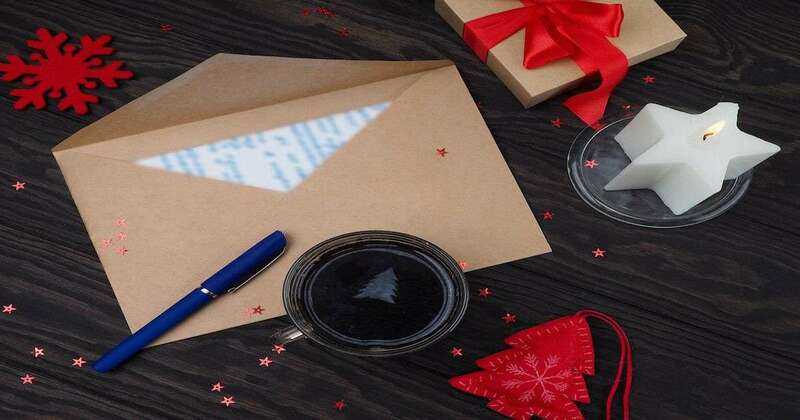 The combination of thoughtful copy and a highly targeted direct mail postcard will work together to boost buyer engagement during the holidays. When possible, personalize using the customer’s name in the salutation. Remember that the size of your business matters. If you’re a smaller business with a manageable list of clients, a handwritten postcard is always the way to go. Thank them, specifically, for whatever they did this year that helped make your company successful. It doesn’t have to be a long letter -- a few sentences of handwritten gratitude will go a long way in establishing meaningful relationships with your clients and customers. If you run a larger company, handwritten notes may not be feasible, but it’s always something to consider. Ah, the end-of-year appeal. It’s written in the DNA of nonprofits everywhere, and for good reason: 33% of all donations are made in December. There are a lot of great ideas out there about how to write a moving holiday appeal (we love this article from the Network for Good). But when it comes to communicating that message, we believe there’s no better way than by combining a direct mail postcard with your nonprofit’s digital platforms. Nonprofits often do end-of-year appeals through email. There’s nothing wrong with that: it’s quick, easy to design, and inexpensive. If your donors are highly engaged and like hearing from you, an email appeal by itself could be plenty in encouraging them to give during the holidays. But this time of year presents a particular challenge in the form of donor fatigue. Many donors give to more than one organization, and being bombarded with requests can wear out even the most charitable individual. Direct mail postcards add a personal touch. Don’t get us wrong, though: email and social media marketing are extremely valuable tools. So, what’s our suggestion? Use them all in conjunction! If you run a nonprofit, use your direct mail postcard for a captivating ask that details who the organization impacted this year and how donors made that happen (don’t forget the compelling imagery!) Give multiple options to donate: include a return envelope, direct the receiver to your website, and mention any crowdfunding pages or Facebook giving tools your organization is utilizing. Mailing postcards while utilizing available digital marketing platforms will make your donor feel special and increase the likelihood that they’ll choose to give. The only way to really take advantage of custom postcard printing during the holiday season is to demonstrate the real value of your offer and put the receiver first. Generic, one-size-fits-all holiday postcards won’t cut it. Think about why your audience would want to come to this event, consider your donor’s real motivations for giving -- and convey that in your direct mail postcard. The end of the year can be a difficult time to cut through the noise, but utilizing direct mail in the right way will make sure your business or nonprofit delivers the messages that will get people to take your desired action.